Dynamite's great miniseries comes to an end as Vampirella tries to save what remains of the crew and convince the reborn Nosferatu to join the fight against the xenomorphs. It's a thrilling, albeit predictable, ending that could only end one way - with lots of blood. Corinna Bechko has done an incredible job of integrating Vampirella in the 'Aliens' world instead of the other way around. It's the reason that the suspense and shocks work because they're earned. This is a sci-fi horror tale rooted in the movie mythology. Over six issues, Bechko has respectfully portrayed the xenomorphs as the vicious merciless killing machines that they are and all the while keeping Vampirella on the run and vulnerable. 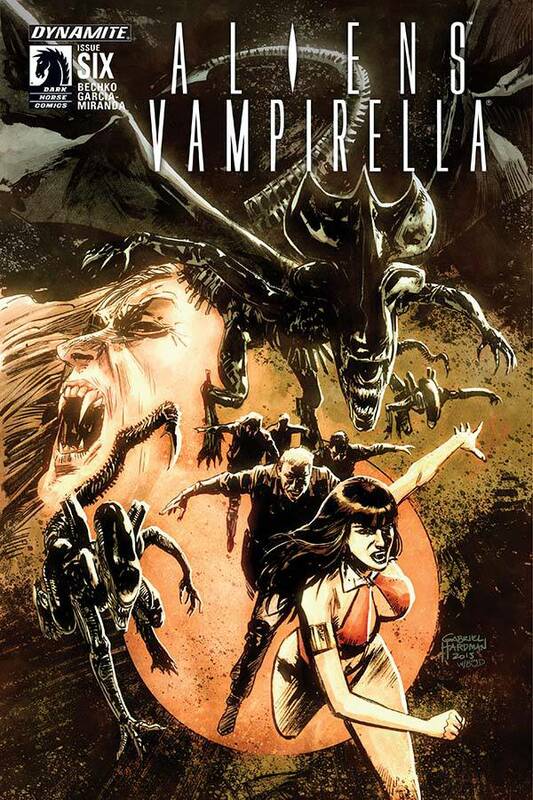 It's a race against time as Vampirella and company try to evade the Queen Vampire/Xenomorph. Meanwhile, Sarah is determined to save them, risking members of her own crew now that they've seen the alien threat that killed her Lars. It's a dangerous decision but it's the one chance Vampirella has to make it off Mars alive. As usual Javier Garcia-Miranda does extraordinary work illustrating 'Aliens/Vampirella.' While character designs are clean and expressive it's Garcia-Miranda's direction of action that is fluid and jolting, providing just the right amount of gore. 'Aliens/Vampirella' is a limited series for fans of 'Aliens' that mostly delivers. The positives outnumber the negatives making this well worth the read. Vampirella shines playing the gutsy specialist trying to keep everyone alive but can't overpower the alien monsters. She has to use what she can to survive, her wits and a broken wing. In the end, things go predictably haywire, lives are lost spectacularly, and it's a total blast.